Chesterfield residents can now have a second job gathering military intelligence. 5 Military Intelligence Battalion is setting up a reserve detachment at Wallis Barracks in Chesterfield and is looking for recruits. 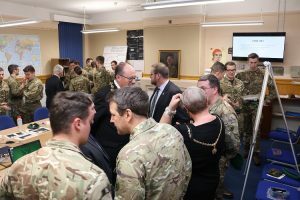 It is one of four Intelligence Corps Army Reserve units in the British Army that trains Intelligence Corps (Military Intelligence) officers and soldiers so that they are ready to deploy on operations. Gathering intelligence is key to the Army’s success and it is the role of the Military Intelligence Analyst to gather, analyse and interpret information. As a qualified Operator you will become an expert in an assigned area, with the need to understand not just adversaries, but culture, politics and outside influencers. 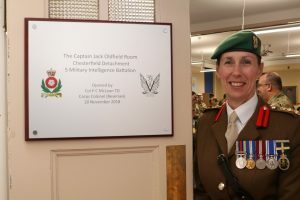 Intelligence Corps soldiers are employed in a wide variety of challenging and rewarding roles in many different locations and Military Intelligence Analysts have responsibility, even at the junior level, with the chance to make a difference in all environments from advising senior commanders to infantry patrols. All Military Intelligence Operators are soldiers first so will complete the Army’s basic training and will need to be able to commit at least 27 days of training a year. 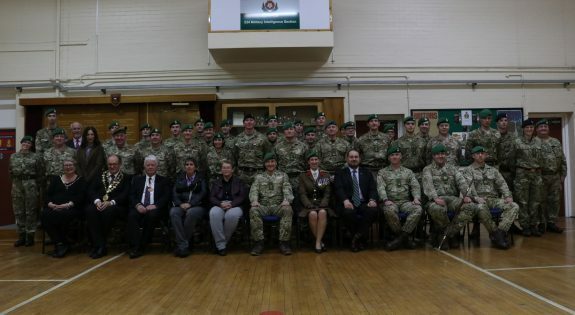 The Chesterfield detachment forms part of the Battalion’s 53 Intelligence Company. 5 Military Intelligence Battalion is part of the 1st Intelligence, Surveillance and Reconnaissance Brigade, based in Wiltshire. Its emblem is a spider. The Intelligence Corps is one of the smallest Corps in the Army. Its soldiers know the how, why and where of any given situation. It was established in 1914. Ever since, it has provided crucial intelligence support in all conflicts and crises with UK involvement , from the World War 1 to the campaign against ISIL. World War Two Intelligence Officer Captain Jack Oldfield who broke the news to 2,000 German Prisoners of War that Hitler was dead will be remembered when the Commanding Officer officially names the detachment’s Ops Room after him. Captain Oldfield who is 104 years old was born in Rawmarch in Yorkshire and now lives in South Ayshire. "We are looking for people who have an enquiring mind, people who are motivated, enjoy solving problems and can work under pressure."